Cyrodiil's master orator wants you to comfort the unfortunate to prove yourself worthy of her training. Once you have a Speechcraft skill of 70, speak with Gruiand Garrana or Varon Vamori. Speak with Tandilwe in the Temple District of the Imperial City to know what she requires of you before training. Speak to every beggar in Cyrodiil to receive master training. Once you raise your Speechcraft skill to 70, speak to Gruiand Garrana in The Great Chapel of Arkay or Varon Vamori in Bravil. They will inform you that they can no longer train you and recommend that you receive your training from a master, Tandilwe. 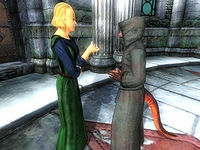 In order to receive Tandilwe's training, you must first speak to every beggar in Cyrodiil. There are nineteen of them, five in the Imperial City, and two each in the other major cities, as listed below. All you need to do is start a dialogue with each of the beggars. There will be no acknowledgment given when you have spoken to all of them; simply return to Tandilwe for training. If you have previously spoken with any beggars (for example, many Thieves Guild quests are facilitated by talking to beggars), then those earlier conversations will count towards this quest. If you can remember the beggars with whom you have already spoken, you do not need to talk with them again. Be aware that you may not kill any beggars while this quest is active. This restriction includes casting Frenzy spells on the beggars so that they attack the guards, effectively causing them to commit suicide (you will not acquire a bounty for doing so but Tandilwe will blame you for the death in any case). Killing the beggars before the quest is issued is perfectly fine; you do not need to talk to those dead beggars to complete this quest. 10 If I want to learn more about Speechcraft, I need to seek out Tandilwe at the Temple of the One in the Imperial City. 20 I need to speak with every beggar in Cyrodiil before Tandilwe will agree to train me. 100 Finishes quest Tandilwe has agreed to train me in Speechcraft. 200 Finishes quest Tandilwe has refused to ever train me, since one of the beggars has been killed. 255 Finishes quest Tandilwe is dead. I have lost my chance to be taught more about Speechcraft. It is possible to use the console to advance through the quest by entering setstage TrainingSpeechcraft stage, where stage is the number of the stage you wish to complete. It is not possible to un-complete (i.e. go back) quest stages. See SetStage for more information. Esta página foi modificada pela última vez à(s) 13h27min de 15 de maio de 2014.